Chutneys can be sweet and savory: offer one of each as a complement to meat and poultry, with toasted bread, or as a substitute for traditional cranberry sauce at Thanksgiving. Photo courtesy Suvir Saran from his book, Indian Home Cooking, A Fresh Introduction to Indian Food, by Suvir Saran and Stephanie Lyness. A condiment is a seasoning, especially a pungent seasoning, that puts spark into food. Our English word is a direct descendant from the Latin condmentum, which sprang from the verb condre, to season. Condiments are a secret ingredient. They add an easy flourish to the most basic foods; they can transform an everyday ham sandwich or roast chicken into something special. Condiments are also evidence of pervasive fusion cuisine at its best. Indian chutneys, French mustards, Italian pestos and Spanish salsas have found their way into almost every home, and onto plates with American roasts, salads and scrambled eggs. We’ve even stepped up our own favorite domestic condiment. Now, if you’re going to pour ketchup on something, make sure it’s a gourmet ketchup with real tomato flavor and fewer sugar calories—not one flavored that tastes like high fructose corn syrup. THE NIBBLE reviews the best gourmet condiments. If you don’t see what you’re looking for here, use the search box, which also checks Blog.TheNibble.com. Use the Contact Us link to recommend your favorite products. Mix condiments with nonfat yogurt to create tasty, low-calorie, creamy dressings. 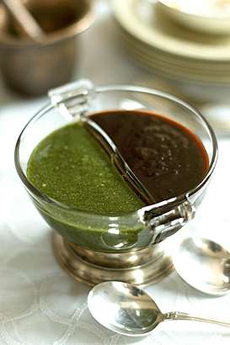 While flavored mustards, chutneys, pestos, salsas, et al are great in of themselves, transforming them into a creamy sauce adds versatility and new taste dimension. 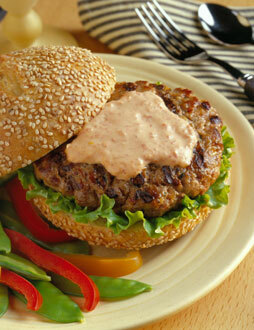 Pork burger with a spicy salsa-yogurt sauce. Photo courtesy of the National Pork Board.